The current flag of the U.S. state of Georgia adopted on May 8, 2003 features has three bars of equal width - two outer red bars, a white bar in the center and a blue canton containing a ring of 13 white stars surrounding the seal, which stand for Georgia's position as one of the original thirteen colonies. The three pillars supporting an arch depicted on the seal represents the three branches of government, the legislative, judicial, and executive while the seal includes the words of the state motto: “Wisdom, Justice, and Moderation.” Georgia leads the nation in the number and variety of different flags. Show your patriotism and love for Georgia with our beautifully crafted outdoor and indoor flags and offered in several sizes of 3’x5’,4’x6’, 5’x8’ 6’x10’ and 8’ x12, we have something special for every flag presentation needs. 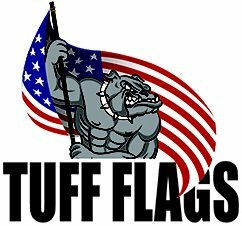 Made from superior quality materials of finished with heading and grommets, our Georgia Flags are 100% made in the USA and has a 6 month guarantee on construction. 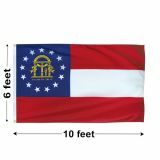 Shop from our complete line of Georgia Flags right away and get the best prices, quick shipping, and much more! 100% customer satisfaction guaranteed! Our Georgia flags are made in America to the exact scale and design and the intricate state emblems are printed with accuracy and brilliant colors. Durable and attractive, our flags are well suited to celebrate state events, festivals, or simply to show your state pride at home or front yard. Choose from premium quality nylon flags that are well suited for high wind areas. Imprinted with UV resistant Dupont inks, finished with heading and grommets and reinforced with lock stitching, our flags will retain their brilliance for a very long time. 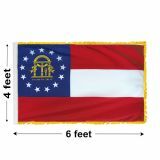 The heavy duty polyester Georgia flag, which is designed to withstand outdoor elements,will make a perfect daily use flag in areas of high wind. Our indoor Georgia flags are accented with beautiful gold fringe and are well suited for displays and parades. Tuff Flags also have indoor flag kits that will offer a complete solution for your flag display needs. You will surely be pleased with the quality and beauty of our industrial grade flags for sure. 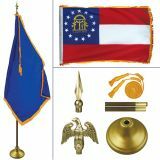 Browse our complete line of Georgia flags and pick up a model that matches your needs. 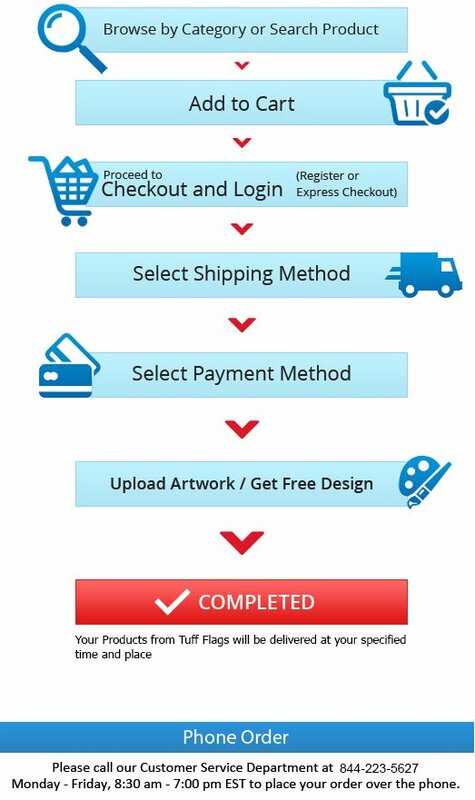 Call us at our toll free number (888) 287-3524 or email us at customercare@tuffflags.com should you need any tips or assistance.